Sensational and affordable single level home set in the Villas at Sunrise Terrace. 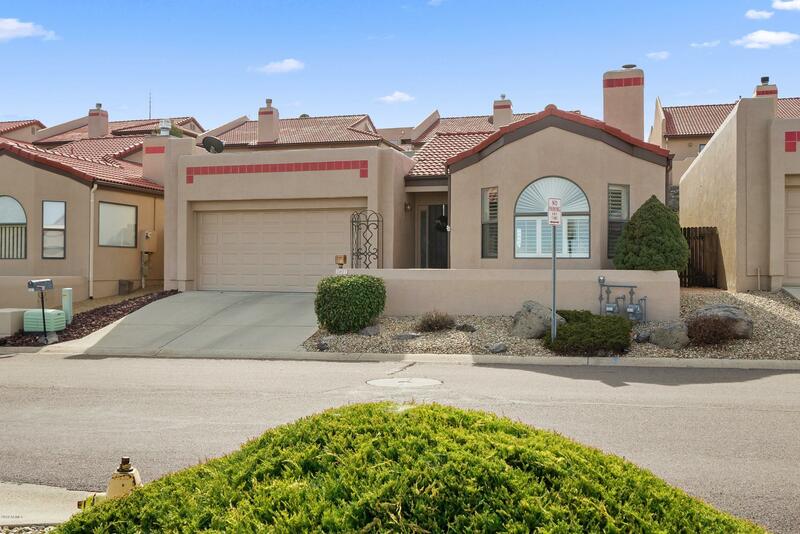 This low maintenance 3-bedroom, 2 full bath home has a 2-car garage with vaulted ceilings and attractive decorative touches. Cozy up in the great room window seat complete with plantation shutters and serene views of Granite Mountain in one direction, and the San Francisco Peaks in the other. The gas fireplace is the focal point in the great room, cladded in reclaimed wood and featuring a gorgeous wood mantle. The kitchen features granite countertops, a plethora of cabinets and black appliances including built-in microwave, dishwasher, smooth-top electric range and refrigerator. The interior of the home has been recently painted and has a new roof from 2017. There's only one step from garage into the home!